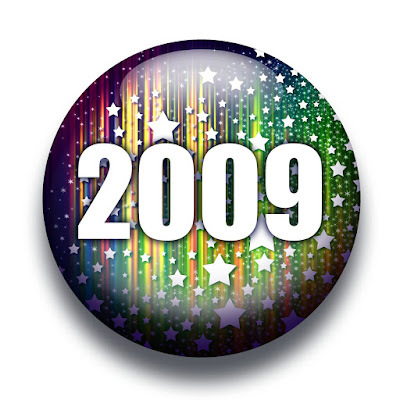 2009 was a very memorable year. Fast and Furious. Something going on nearly every month and not little things either.... BIG things. We started off the year with my son, his wife and their dog moving into our guest room "for a couple of months." Thankfully, we had a room for them to move into and our dogs get along with theirs because the couple of months turned into 11. That does NOT mean it was a bad 11 months. We had a bunch of fun, great dinners, rides on the beach and plenty of laughs. It was almost bittersweet when they moved out.... almost. I think my neighbors were relieved that Wilhelm the weiner found "new digs." He was a bit of a barker. But they bought a really nice home in Atascadero and are now busy decorating and fixing it up in their spare time. Willy loves his new home and has lots of property to run around on. January was also the month our daughter, Tiffany, decided to get married.... in two weeks. Yes, you heard that right, we had two weeks notice. We worked feverishly to find the dress, wedding place, reception place, flowers, photography, food and drink, etc. You know what? It was absolutely LOVELY. She married on the beach in Avila and one of her co-workers allowed her to use their property in the foothills of Nipomo for the reception. Chris' mom, Stephanie, made the beautiful wedding cake and one of her friends, a florist, did all the flowers. We all took photos of the wedding and reception and it was so beautiful!! Isn't that a lovely cake?? 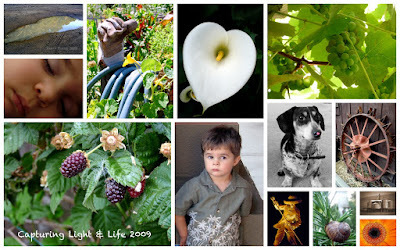 Throughout the year, I was trying to take pictures for my 365 picture a year website, Capturing Light and Life. As events would take place, I'd grab my camera and go. Using my camera's manual and trial and error, I think I managed to "grow" in my abilities. In October, our local free paper, The New Times, ran a photo contest and I entered a few pictures. Didn't win anything, but had a great time and plan to start up again this year. We had 3 baby showers, 1 bridal shower, 2 weddings and 3 new babies added this year. We had the party throwing down to a science! Each time we threw a party beginning with Tiffany's wedding reception, we added to a party bin that contained, napkins, plates, silverware, table decorations, etc. In addition, we bought some new banquet tables and chairs that take up very little room. 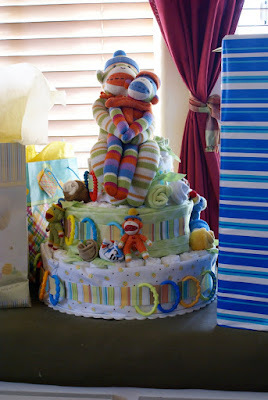 I made my very first (and second) diaper cakes this year. They turned out so cute! What! No pictures of the babies you say?? Oh, I have those too. The first baby of the year. 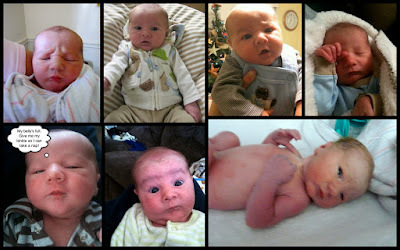 Born May 23, 2009, weighing 8lbs. 1 oz. (and his mom is a little tiny thing!) Anthony Joseph Velazquez Weems, son of my daughter, Melody and her man, Michael Velazquez. 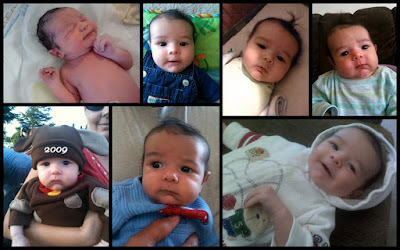 The picture of him on the lower right was his first haircut which was this past Saturday. He is such a big boy now. As the year ends, he has 2 bottom teeth, is trying to crawl, weighed 18 lbs. at his last Dr. appointment and is a really mellow baby. My daughter, Melody is adding to his blog pretty regularly so you can find more information over there. 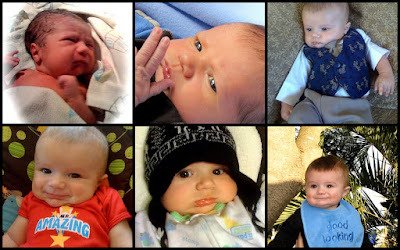 Daniel James McKenzie, born August 7, 2009, weighing 7lbs. 14oz, son of my daughter, Rebecca, and her husband, Mathew McKenzie. Danny is also a funny little man. He's almost 5 months old, already has two bottom teeth, can nearly sit up on his own and really loves and admires his big brother, Scott. He looks alot like Scott and we are already finding that if we don't label his pictures, we are getting them mixed up with his brother. He's a little Mini Me. Then the 3rd little cousin that was due the 3rd of December arrived the 14th of November. This is little Everest Alan Koehler, son of my daughter, Tiffany, and her husband Chris Koehler. He weighed in at 6 lbs. 8 oz. He is a little peanut, smallest of all the babies but sweet, sweet, SWEET! He makes the funniest sounds and is just getting to the more awake/aware stage. He looks like both his parents and has strawberry blonde hair and is very fair complected. I KNOW, 3 new grandsons in one year!! And of course, we can't forget big brother Scott. Scotty started pre-school in September and really likes it! 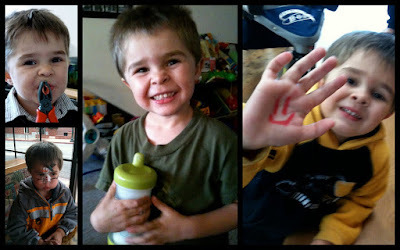 The last picture up there is him with a Happy Face on his hand for good behavior. Each day at pre-school he does an educational paper and some art. Then he has some free play indoors and out with his friends and even a circle time to sing and have stories read. He is going to be 4 in 2010!! Wow, how time flies. Then November 26th, our son and his wife, Kristen had their 2nd wedding, or "official" wedding. They were married the year prior in San Luis Obispo courthouse before they moved to Tracy, CA. It was beautiful, fun, and very memorable. He "cleans up" pretty nicely! And a natural smile to boot! Isn't this a gorgeous cake?? Lime and Eggplant were the colors and the orchids were the perfect inspiration! Kristen, beautiful.... what a fabulous day! All that busyness and we still found time for a vacation!! I KNOW, amazing right? Wes and I took our scooters up Hwy. 395 to Bridgeport, then West to Hwy. 49 and down into the California Valley, a trip of nearly 1000 miles. We took only what we could carry and even though we were on the road for about 5 days.... we could have gone another 3 to 4 days. 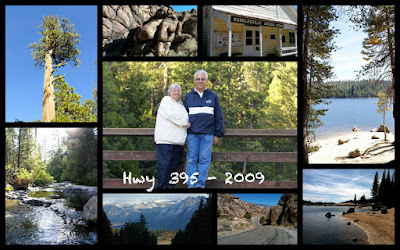 We had so much fun that we are already planning another for this year, we think some of Route 66. WE SURVIVED OUR BUSIEST YEAR EVER! I found you from Ali's One Little Word post. You are making me home sick! We moved from Calif. to Mass. over the summer and i am in culture (and weather) shock. Gorgeous photos!